So says the Canadian singer/songwriter Joni Mitchell in a rare interview with Jian Ghomeshi aired in early June on CBC Radio’s Q. My own experience with a variety of media corroborates this. When the producer of CBC Radio’s Spark contacted me about the possibility of an interview about how Hutterites approach and interact with technology, I was hesitant. This was bigger than anything I had ever done, and radio can be a very impromptu medium. I wasn’t confident that I would be able to communicate clearly and effectively in such a high pressure situation. My previous radio experiences had been scripted, but in this case I would only have an idea of what the questions would be like based on a pre-interview. As I hesitated I realized that it was the fear of being misunderstood or saying something foolish that was holding me back. I also considered my rather unfortunate tendency of using ‘earthy’ expressions when I speak. Further reflection convinced me that accepting this opportunity would teach me more than I could lose. I was especially interested in learning more about how radio works and I’ve always wanted to see the inside of the CBC Winnipeg building. After agonizing about it for a while and checking in with my leadership, I accepted the invitation to speak with Nora Young. As the interview approached I found myself discussing the topic with a variety of people. I always asked the question, “What do you think main-stream society can learn from the Hutterite approach to technology?” My favorite answer was this: “Nit verdomp viel! Not a heck of a lot!” I didn’t say that, though, for obvious reasons! On the day I was to record the interview I was dropped off in downtown Winnipeg. As I walked across Portage Avenue, signed into the CBC building, I kept thinking to myself, “Hmm, this is going to be interesting.” And it was. My contact here in Winnipeg was very pleasant and relaxed as we waited for the line from Toronto to open at 1. This calmed me as well. 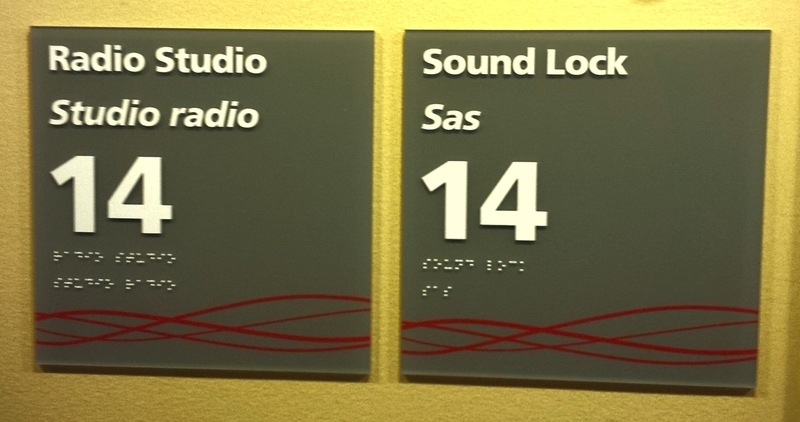 We settled into Studio 14 and when our mic issues were resolved, we began. After greetings, the first thing Nora Young asked me to do was introduce myself, and say a few words about myself. For some reason, I said it with a feeling of laughter in my voice, as if I just finished laughing about something. I’m not sure what was so amusing. To make sure that my tongue didn’t move faster than my brain, I intentionally spoke with a slower than usual tempo. I found this strategy to work well in most situations. By slowing down I was able to go on minor tangents, but still remain focused on the questions asked. The body of the interview went quite smoothly, and I only remember two times when I wasn’t sure of what to say. In the end these questions weren’t needed anyway. Whew. In the days following the experience, I couldn’t help but obsess about the things that I had said but wanted to take back, and about the things I didn’t say but should have. The height of my humiliation was the fact that I wasn’t able to give a clear and concise response on who Hutterites are. This was the only question I was certain would be asked and had actually prepared for it. My ears still burn a bit when I think of how I stumbled through it. Fortunately, only a snippet of it was needed due to the time constraints of the show. Nora Young has a great radio voice; lots of resonance. What I didn’t say, but should have: When Nora Young asked me how technology gets introduced into common usage among Hutterites, I said that usually leaders in a community will experiment with it or make a decision on how new technology can or should be used. Theoretically, that’s how it should be, but this answer does not take into account the underground scene by which some technology becomes accepted. I really need to stop using the word ‘wisely’ so much. It is, clearly, ‘unwise’. I’ve reached the conclusion that being a good interviewee, like being a good interviewer, takes practice. I thank the Spark team for a positive experience. I do not feel misunderstood. In fact, I think you made me sound better than I actually did. A podcast of the interview can be heard here. Hi Kenny, thanks for blogging about your experience with CBC Radio! I listened to it a few days ago and thought it went well. I didn’t notice any stumbling or other problems. The second thing I noted is that you pronounced “Leut” differently than I’d heard before. I’d heard it almost as “lite” previously – Dariusleut as “Dare-ee-lite,” for example. One thing I would very much like to see – or, more accurately, hear – is the terms associated with the HBC pronounced by Hutterites. For example, Gemeinschaf, Gütergemeinschaft, Gelassenheit, et al. I would also very much – very, very much – like to hear some Hutterisch. I saw in the blog section of a different website some talk about a project involving Hutterisch – I think a sound recording of a conversation in English, German, and then Hutterisch would be a valuable addition to the Hutterite-related materials available on the Internet. As a non-Hutterite, I found the interview very interesting. I was impressed by your thoughtful answers and inspired to look for your website. I hope many others who listened that day or who find the interview online will arrive at a new understanding, I feel that we need to keep working to break down walls that exist between individuals and communities so that our short lives here on earth will be more meaningful and so that we can help one another in our need. All our lives will be enriched as a result. I really enjoyed listening to your interview and it is what brought me here to your blog for the first time. I especially resonated with your commentary on how your time belongs to the community and to spend excessive time with technology is to take that time away from our communities. Yes! Thank you for this perspective. It has already helped me. Thank you. Rachel in chilliwack. I have taught some journeyman trades qualification courses for Hutterian Brethren in Manitoba over the last few years using the Hutterian Broadband Network and the ITV network. It has been a pure pleasure and I have to say that main-stream society, particularly the education system in rural communities could learn a lot. They could learn not only about social organization and working toward a common good but also they could learn about making technology work for the good of communities. The story of the building of the HBN is a testimony to collaboration, determination, skill and ingenuity. I heard the interview for the first time today (Sunday Dec. 22nd 2013). I was quite impressed with the interview and appreciated the thoughtfulness of your responses. I very much appreciated the comment about community including one’s time. I am no longer in Christian community (it “blew up’ many years ago) but I am by no means antithetical to it. If only egos could stay out and Christian love reign. In my present church (which happens to be Anapaptist – Brethren in Christ), I find there is too much emphasis on doing things for the church and in giving money. I have pointed out to people that while I might not have great skills to do things for the church or not be a big giver in terms of money, I do make myself available with my time to encourage, to listen and to pray with others. I don’t think such things can be measured in earthly terms.